When I first returned to Baltimore in 2005, after working for nearly 10 years in the Holy Land, I spent some time just driving around the city to get reacquainted with it. I was immediately struck by the number of men, mostly young African-Americans, congregating on street corners or porch stoops in the middle of the day, a time when most people are at work. At that time, Baltimore City’s unemployment rate was around 7 percent, not nearly as high as the 12 percent it would reach in 2010 or even the 7.8 percent reported in April 2014. And yet, even then, there was a pervasive sense of hopelessness and lost opportunity in those faces of men who had the odds so badly stacked against them—poverty, poor education, lack of employment, drug addictions and drug-related crime in their neighborhoods, and friends and family members who had been shot or imprisoned. For them to envision a brighter future, to see their way to a safer, more stable life, was nearly impossible. Soon I would become aware of how our system of sentencing and incarceration contributes to all of this and helps to create a class of citizens who have little hope of ever advancing beyond their dreadful way of life. While the issues of urban poverty and crime in the United States are complex, many people are starting to understand that there is one facet that is recognizable and that has reached epic proportions, so much so that workers in the field are labeling it a public health crisis: the mass incarceration of staggering numbers of people—primarily young African-American and Latino men—for nonviolent, mostly drug-related offenses. It is a public health crisis because the effect of mass incarceration reaches far beyond the imprisoned individual. It tears apart families, sinking them further into poverty and leaving one out of every 28 children with a parent who is incarcerated, two thirds of whom are in prison or jail for nonviolent crimes. It creates a subclass of citizens who will have great difficulty finding gainful employment on their return to society. It disenfranchises citizens by taking away their right to vote, thereby stripping them of their ability to influence lawmakers for their own betterment and that of society itself. This public health crisis is such because of the failures of the correctional system to deal adequately with the substance abuse, mental problems and physical health issues of inmates. And instead of preparing inmates for successful reentry into society, it prepares them for reentry into prison, a fact evidenced by the raft of post-release court-mandated classes, drug screenings, meetings with probation officers and addiction recovery meetings, among other things. The more than four-decade long war on drugs was meant to make drug abuse public enemy number one and also to direct federal resources to the prevention of new addicts and the rehabilitation of those already addicted. But a quick review of statistics is all that is needed to demonstrate the failures of this effort and the new addiction it has created: a penchant for locking people up in prison. The United States has 5 percent of the world’s population and nearly 25 percent of the world’s prisoners. In 1974, 100 out of every 100,000 citizens of this country were in prison; today, there are roughly 700 people in prison or jail for every 100,000 Americans. The next highest incarceration rate occurs in the Russian Federation, which incarcerates 474 people for every 100,000 of its citizens. 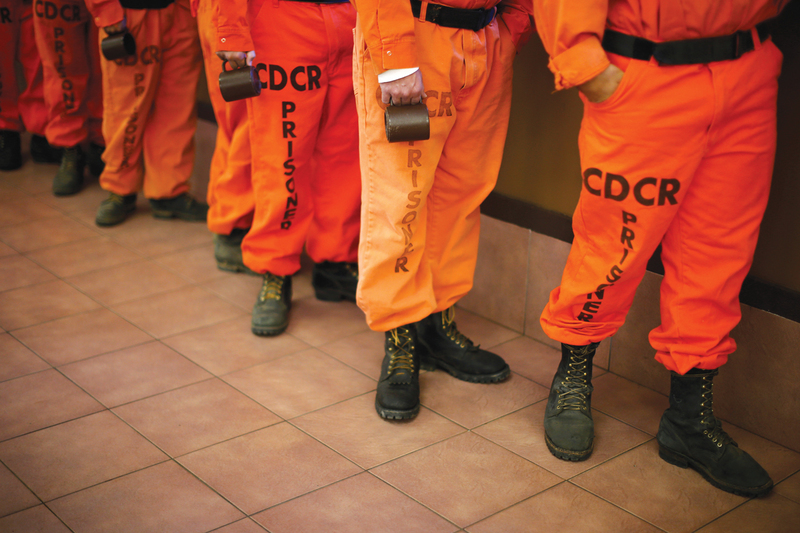 There are now 12 times as many drug offenders in state prisons as there were 30 years ago. Drug offenders make up nearly half the federal prison inmates, most of whom are incarcerated for nonviolent trafficking or possession charges. Despite similar rates of substance abuse among whites and African-Americans, the U.S. Department of Justice reports that almost twice as many African-Americans as whites are incarcerated for drug offenses. African-Americans make up 13 percent of the U.S. population but 45 percent of those incarcerated for drug violations. It is now estimated that one in three African-Americans will spend time in prison during his or her lifetime; one in five will be incarcerated because of drug laws. According to the Bureau of Justice Statistics, two out of every three prisoners released will be rearrested within three years, and nearly half of those released from prison will be incarcerated again within three years. The Sentencing Project reports that the number of inmates in privately run, for-profit prisons grew by 80 percent between 1999 and 2010, even though the total number of prisoners in the United States grew by only 18 percent. These for-profit prisons use contracts to incentivize incarceration, and they impose “fines” on the contracting government if it does not provide the stipulated quota of inmates. They maximize their profit by offering lower pay to less qualified staff and providing fewer programs for training and rehabilitation. The assault rate in private prisons is twice that in public prisons, and they are rife with documented physical and sexual abuse of inmates by the staff. Forty percent of juveniles sent to prison will serve their time in a private facility such as this. We have created a subclass of citizens and now, so that we don’t have to deal with them directly, we are creating a for-profit industry, not subject to federal and state prison regulations, to house these citizens. Moreover, we have a responsibility to fight injustice, to extend mercy to those who have made poor choices and to help lead them on a path of dignity toward redemption. At a recent U.S.C.C.B. briefing on Capitol Hill regarding mass incarceration, one of the speakers made reference to a part in the musical “Les Misérables” that shows remarkable parallels to today and which prompted me to reflect on it further. In “Les Misérables,” when Jean Valjean is released after being imprisoned for 19 years for a petty crime, he says with hope: “And now let’s see what this new world will do for me!” Yet he encounters a world filled with injustice and hopelessness. He becomes so desperate to escape his poverty that he steals household silver from Bishop Myriel, who had kindly offered him shelter. Unfortunately, this is not so different from the situation that many convicted felons face today—citizens returning after being imprisoned for nonviolent crimes and then released to fend for themselves, while encountering one obstacle after another to doing so honestly. It is a fact of life that people will make poor choices, either out of lack of judgment, lack of guidance or desperation. But just as Bishop Myriel showed mercy towards Jean Valjean and provided both the material and spiritual help he needed to set out on the right path, so too must we be able to lead those who have made poor choices to rehabilitation, redemption and reintegration. In actuality, the path begins well before any serious criminal activity occurs. In this regard, the Catholic Church has a unique opportunity to be a conduit of merciful and transformative action through our Catholic schools. In a recent book entitled Lost Classroom, Lost Community: Catholic Schools’ Importance in Urban America (University of Chicago Press), Margaret F. Brinig and Nicole Stelle Garnett, law professors at the University of Notre Dame, concluded that the presence of Catholic schools is positively correlated with neighborhood stability and lower crime. They also concluded that Catholic elementary schools help foster closer social connections and a greater sense of responsibility for the common good, what they call social capital. Deterring criminal behavior and reducing rates of incarceration also require programs that equip people to overcome the challenges that result from a poor education, lack of marketable job skills and the legacy of physical abuse, chemical dependency and disease that often plague those who live in poverty and despair. Access to these programs should be easy and plentiful, which means they must be fully funded, professionally staffed and centrally located, and they must be visible and integrated into our systems and institutions so they can effectively reach those they are designed to serve. The tide of public opinion and legislation seems to be turning favorably in this direction. A recent Pew Research Center survey shows that 67 percent of Americans believe the government should focus more on providing treatment for drug users, while only 26 percent feel it should focus on prosecuting drug users. The survey also showed that in 2014, 63 percent of Americans supported the elimination of mandatory sentences for nonviolent drug crimes, up from 47 percent in 2001. Proposals like the Smarter Sentencing Act currently being debated by Congress, which would reduce mandatory minimum sentences for those convicted of federal drug offenses, are leading the way in trying to address the problems associated with mass incarceration by keeping more nonviolent offenders out of prison to begin with. Those who do end up serving sentences in prison must get the help they need to be productive and law abiding citizens when they are released. This is so obvious that it seems strange to have to make such a statement. One need not condone actions that harm society, but we must seek responses that do not result in a recidivism rate of nearly 70 percent. There must be a clear path to overcoming dependency issues that includes being able to find housing, buy food and support children and finding acceptance and forgiveness from others. In so doing, we must seek to mine the potential given each person by God and to restore dignity and wholeness to their lives. This is critical not only for former inmates but for their families and our communities as well. No one aspires to become a drug addict and go to jail. People do not freely choose to live where there are drugs being sold on the streets, gunshots being fired, the unemployed gathered at every corner and temptations to succumb to a full menu of vices at every turn. We are called to acknowledge that our society has set up a structure of inequality, where those who are poor or members of a minority group suffer disproportionately for their mistakes and are not given a chance to recover their footing in society. Our Catholic parishes can play a critical role here by exploring ways to help welcome back not former inmates but returning citizens. In his recent visits to prisons in Italy, Pope Francis continually spoke about the challenges faced by inmates returning to society and the need for them to have hope. He called upon institutions to ensure that an “effective reinsertion in society” is not neglected, lest the penalty being served become just a punishment and instrument of social retaliation. And he emphasized that the dignity of the human person must be at the center of all we do—that we must always have hope and give hope because God’s love for each one of us is eternal and his forgiveness is inexhaustible. God “never condemns. He never forgives only, but he forgives and accompanies.... This is the love of God, and we must imitate him!” May we, like God, never tire of forgiving, of accompanying those who need forgiveness on a path to dignity and wholeness. Correction, Feb. 19, 2015: Bishop Madden's author ID has been updated to reflect the fact that his term as chairman of the U.S. Conference of Catholic Bishops’ Committee on Ecumenical and Interreligious Affairs has ended. Thank you for a thoughtful and provocative overview of this issue. The trend to privatize so many social institutions is deeply troubling to me. The cultural idol of "the free market" must be questioned and resisted when it ignores implications for the common good of its practices. Local churches need to take responsibility for the influence of big money on political representation. Thank you for a very insightful article. I'm convinced if we really want to change this, the Church has to be the leader. And unfortunately, the Church is not teaching anything about this. We may generally hear messages about love and mercy, but I never hear teaching on this subject specifically. And, turning this issue over to a civil government has never worked well either. It is our responsibility. I pray our priests and bishops can have the courage to teach this message at the parish level and develop ways we can all be engaged in changing this terrible situation. My husband and I worked together with James O´Malley and Susan Fernandez in starting up and volunteering with what we called Los Mentores de San Ignacio, with the approval of the various parish priests at San Ignacio de Loyola parish in Rio Piedras, Puerto Rico. Our group varied from six to ten, depending on personal commitments. The troubled youngsters - about 95% were dropouts with learning problems; 100% were poverty-level, and of course Puerto Rican. 98% of the boys, 13 to 18 years of age usually, were respectful and glad to see us. On site guards and social workers were For seven years we went on a weekly basis to the boys´ detention center, and worked one on one with a variety of motivational type activities suggested by various social workers and trainers. We always began and ended with a prayer, of course. One memorable time we took about ten young men and their guards to Sacred Heart University to use the pool, eat in the cafeteria, and end up with a specially-tailored Taizé type service in the chapel. If only we could have done that on a twice or thrice yearly basis! Main problems encountered: keeping up our own spirits (keeping in mind we were there because Christ instructed us: I was in prison, and did you visit me? ); seeking ways and methods to interest the boys (we were usually from five to seven volunteers from the parish and met a few times a year to pray and practice workshop materials); dealing with the authorities, whose rules and regs often changed, sometimes in an arbitrary fashion - the schedules at detention centers, which in this case were prisons, were variable; maintaining good personal relationships with guards and on-site supervisors. I had to continue visiting top and mid-level directors to assure our access. An AmeriCorps*VISTA team initially helped us a great deal in implementing access to the center..and that's yet another story! To draw on: Parishes abound in teachers, social workers and psychologists who can give specific models for use with the young people; Jesuit parish priests always supported us, and allowed us to speak at Mass occasionally to seek volunteer mentors from the community; relationships with a Catholic university. Needs: expand on the parish awareness of this potential ministry, through homilies and bulletins. Full commitment on the part of our over-worked priests, who need robust support from us all. Maybe we could learn something from the Methodists, who have such vibrant outreach structure and communities... Interesting and sobering fact: Evangelical Christians were there every day with their bibles. For the most part, we were the only volunteer Catholics - and this in an island which is allegedly still mainly Catholic! Thank God for our inspiring Holy Father! Bishop Madden seems genuinely concerned. However, his focus is incorrect. I am amazed that the Church, the Media and our government do not focus on the destruction of the inner city, African-American community. 72% of African American children are born out of wedlock---often from fathers who have multiple children with multiple women. In 48 States out of 50, African American students have the highest High School drop-out rates. Union-run inner city schools are awful---over priced and ineffective. Unemployment and unemployability--are epidemic. In Chicago--92 % of teen age black males are unemployed. Crime is a way of life---especially with no male guides/examples/directions in these communities. Prison becomes a way of life, a rite of passage. This is horrible but it will not be changed until we focus. Over the centuries--Catholic educators---including Saints have focused on the poorest --in cities to--educate, convert, redirect. As long as we gather statistics, do studies and ring our hands at "unfairness---the horror will continue. God help us! Catholic educators perhaps could focus on: Why the divorce rate runs dramatically lower in marriages where both spouses are union members. Why is poverty 52% in “right to work states” vs. 44% in states without “right to work”? Why does deep red state incarceration of blacks run 50% higher? Bishop Myriel’s offer to shelter Jean Valjean brings to mind Charles Dickens’ novels, Oliver Twist and David Copperfield. Boys Town founder Fr. Flanagan always marveled at Dickens’ grasp of the human situation. Thank you for this article and your work to bring this issue to public awareness, Bishop Madden. I have worked with prisoners and their families for the last 20 years or more. Most people who are not directly affected by the tragedy of incarceration do not want to know about it. Sometimes I feel like I live in Germany in the 30s when the world looked away from the "camps" that were established to exterminate people. Camps in urban neighborhoods (Dachau) where you could smell burning bodies. Every 200 miles or so, in this great land, there are massive complexes surrounded by razor wire and watched by constantly by sharp shooters, where hundreds of men and women are caged. Many of these inmates are warehoused for major portions of their lives, or the entirety of their lives. They are given no chance to redeem themselves or to pay back to society for the harm they may have caused. They are thrown away. Most of them are forgotten. Some day, I hope, we will be able to recognize and acknowledge this horror of a Holocaust, happening in our own back yard. The huge network of corruption and kickbacks built around the profits that can be made in this Industry of Incarceration contributes to the evil that we refuse to see and name. I am sorry but I find your comparison of modern prisons, as bad as they may be, to the concentration camps of Nazi Germany not only offensive, but out right disgusting. Such rhetoric only serves to push those that might disagree with the stance of prison reform even further away and serves as place that they can point to as why they should not listen. You should be absolutely ashamed that you would even invoke such a comparison. I am sorry you are offended, Cresencio. I am not ashamed and stand by my comparison. It is, indeed, this bad. Those who knew what was happening in Germany in the 1930s and tried to tell what they saw and knew were similarly dismissed. I am well aware that in our prisons there are those who have committed horrendous crimes against others. (There are also very many who have not.) Our prisons are not places where those who have failed can make amends or redeem themselves - or even places where people who are dangerous can be kept from further damage to others (or themselves) - but rather places where the darkness of humanity is projected onto "bad" people. This is the same evil that was behind the horror of the Holocaust. Prisoners are the bottom of the barrel now, the lepers of our age. I wish you well, Cresencio. You don't have to buy into the "bad people" myth to redeem yourself. Look a little deeper. We are all a complex mixture of good and bad. The term “mass incarceration” is reminiscent of the Marxist theoretician’s use of “class” in their analysis of social structure, and helps drive a picture that the only “class” inside prisons are the poor, especially the minority poor; an argument sadly and ironically more representative of Communist countries than America. The reasons American prisons are full is twofold: on the one hand liberal legislators have stopped new prison construction, especially in California and New York, and on the other hand, the full prisons are a result of effective broken windows policing and three strikes sentencing; which have resulted in a decades long crime rate reduction; which is now in danger due to the effectiveness of the “mass incarceration” narrative. I know better than most that prison is not a fun place to be, having spent 12 years of my 20 years as a professional criminal—my crimes were theft and robbery—within several maximum security federal and state prisons, as well as many local jails; but it is the only effective way we have, as a society, to isolate the criminal, the often dangerous aggressor, from the often innocent victims of crime. This form of incapacitation, imprisonment, is extremely effective in this regard, though also expecting it to function as an effective rehabilitative venue has proven, so far, to be a failure. I was a chronic offender and I know that each arrest and commitment to jail or juvenile hall, was, for me, just another step in the building of my criminal career, a path I had chosen by the time I was barely a teenager; a path of glamour and freedom that consumed my life for decades; and rather than being scared by the many jail or prison experiences, I was heartened by them as they put me in close contact with my real peers, other professional criminals. This is where I also became acculturated to the criminal/carceral world, learning its mores, adapting its artifacts, living its ways, a way of life I only finally became completely free of after becoming Catholic and being baptized, when the final remnants of the predatory and self-centered criminality that had informed my life for so many years gushed out of me in the deep tears shed during baptism when my sins were forgiven me. Yes, we need prisons, for they are the only civilized way to isolate the aggressor from the innocent; and they must be civilized, which the majority of prisons in the United States are. Based on my experience and validated by my research, criminal justice policy and practice sways between the liberal rehabilitative program approach and the conservative policing, sentencing, and incarceration approach, and right now we do appear to be swinging back to the liberal, but it is my hope that we can, as a society, develop and keep only those programs that are rigorously evaluated and proven successful, while retaining policing, sentencing and incarcerative strategies that have already proven their success reducing crime. The most important thing we have to do, in my opinion, is to remember what most of us already feel to be true; that becoming a professional criminal is largely a result of an individual decision, and becoming truly reformed will also come about as the result of an individual decision; and in the making of this individual decision, those reformed criminals who work with other criminals to help them get on the path they have already traveled, are a valuable asset, perhaps the very best asset, that is still too rarely utilized. David H. Lukenbill, President The Lampstand Foundation It takes a reformed criminal to reform criminals. Do you know what percentage of the inmate population of the USA are "professional" criminals? This article also appeared in print, under the headline "Prison Addiction," in the February 23, 2015 issue. Most Rev. Denis J. Madden, auxiliary bishop of the Archdiocese of Baltimore, was chairman of the U.S. Conference of Catholic Bishops’ Committee on Ecumenical and Interreligious Affairs.